The awesome Robyn Bachar was kind enough to interview me on her blog. And I repaid her kindness by going on and on about how I can’t stand elves. Although Robyn likes elves, she also writes all kinds of great stuff, so don’t hold the elven-love thing against her. Robyn’s Bad Witch series is quite cool (I’m looking forward to reading Fire in the Blood), and if you like spicy space romance then check out the Cy’ren Rising series. 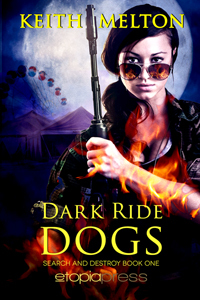 I’m very happy to announce that Dark Ride Dogs is live on various online bookseller sites. Thanks again to all my readers and everyone who has supported me over the years! I hope you enjoy this one.